We already know that you love to read. We also already know that you love pizza. So we love this idea that combines both reading and pizza, and we think you’ll LOVE it too. Every year LIANZA picks and awards the best books for children and young adults that has been published in New Zealand (or by a New Zealander) in the last year. 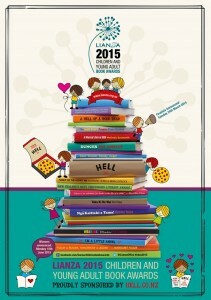 Recently LIANZA released the list of finalist books. There are some amazing titles on there and we recommend all of them. We’re not sure how they will possibly pick the winners, but they plan to announce them on June 15th. As part of the book awards the judges want to reward you for reading. Visit your local Wellington City Library and grab yourself a Hell Pizza Wheel from the counter. Your pizza wheel will get clicked every time you check out and read a library book (one click per book). Once all 7 segments on the pizza wheel have been clicked, you can take it to your local Hell Pizza shop and exchange it for a 333 pizza from their HELLthy menu range. Once you have completed a wheel you can start on another, and another… until we run out of pizza wheels. Yes, you read that correctly – read 7 books and get a delicious pizza. So what are you waiting for? Previous Article Looking for a good book to read? LIANZA Children and Teens book award finalists announced. Next Article Looking for something to do? Where do we hand in our completed wheels? Well done on completing a pizza wheel! You can hand it in to any Hell Pizza store and exchange it for a 333 pizza from the HELLthy menu options.